In January, I completely overpacked for a cruise. I paused for a second to let my brain process this unusual (for me) concept. The cruise was leaving and coming back to Sydney; it was just a simple train ride to the port for us, and no flight to worry about. No restrictions on toiletry sizes. If there was ever a time to splurge on luggage, this would be it. The Ovation of the Seas cruise ship by Royal Caribbean. Over the course of 8 nights, we would enjoy the pools, the beaches, trips to the gym, sightseeing in Vanuatu and New Caledonia, shows in the theater, casual meals, dressy meals, and not one, but two formal nights on the boat. Yes, I packed way more than I do, for any type of trip, and I still managed to get it all into a carry-on suitcase and small backpack! Being the ultralight packer that I am, I considered this another packing experiment. And boy did I learn and reaffirm some big points. Let’s have a closer look at the experiment before jumping to the juicy learnings towards the end of this post. My suitcase that is quite full and overpacked, especially when adding on a small backpack with laptop and extra bits. My specific South Pacific cruise went from Sydney to Vanuatu to New Caledonia and back to Sydney, a total course of 8 nights on the ship with 2 port visits. It took place during mid-January, the summer season in the Southern Hemisphere, with a forecast of mostly sun and some sun showers on our first port visit in Vanuatu. Dinners included multiple casual and dressy nights, and the chance to partake in TWO formal evenings. My favorite shoes right now- the Naot Dorith sandals- that probably could have been used for dressing up and *maybe* even formal nights, knocking out 2 other pairs of shoes. Long story short, I packed a lot, and definitely more than I needed in the clothes and shoes department. I easily could have done with 1 workout outfit that I rinsed and hung to dry in between sessions. I ended up going to the gym 3 times for less than an hour each go. I easily could have done with 1 formal dress, even if we did attend/take part in both formal nights. Heck, a solid-colored maxi/sundress would have dressed up well enough for the night. I didn’t wear the kitten heels, and the dressy (blingy) wedges worked perfectly for the formal nights. My cute Naot walking sandals could have even done the trick, knocking out 2 extra pairs of shoes from the mix. I didn’t wear the jeans, the packable jacket, the merino wrap cardigan, the summer robe, the swimsuit coverup, or one of my swimsuits entirely. I could probably have done without the jean shorts as well. The waterproof pouch still has the tags on it that I didn’t take off before packing! And let’s not forget that I didn’t crack my laptop open once. Not once! You might think you’ll have some down time over the course of 8 days, but not so much when on a cruise ship where activities are scheduled all day every day. Even though I packed options, I still found myself wearing the same things over and over again. Notice the swimsuit top and loose tank-top while 1) hanging out on the deck, 2) getting ready to perform the Thriller dance, and 3) sightseeing in Vanuatu. 1 – Packing for a cruise is a daunting experience. A cruise condenses so many different experiences into one relatively short trip. Not only are you thinking about formal nights and fancy dinners, lounging next to pools and beaches, hitting the gym, and exploring new lands, but you are also considering the most stressful part of it all: the fact you are secluded, often for days, in the middle of the ocean. That sort of trapped feeling, combined with the fact my boyfriend wanted to “really experience it all”, added extra stress to the packing experience. Even though it didn’t need to. Just like when traveling to land-based destinations, you can purchase most essentials on the cruise ship (or while in port). And for things like shore excursions, the ship and local businesses have assumed you will need/buy/rent extras for them. 2 – If I can fit this much stuff into carry-on sized luggage, then anyone can downsize to carry-on only luggage without drama. Ladiessss, I had so many shoes and so many articles of clothing, plus all the extra “extras”, and it all still fit into carry-on sized luggage. If you are questioning whether or not you can travel with carry-on only sized luggage, take this as your answer: YOU CAN DO IT. Ali even went on an Antarctica cruise taking only carry-on sized luggage. 3 – Forgetting something you think is major probably isn’t major at all. My boyfriend forgot his dress shoes. When we made this discovery while unpacking into our cabin, we both got a bit flustered at forgetting something that could make or break a suit-wearing experience. At the end of the day, he got all formal-y in a suit jacket and tennis shoes, and you know what? It didn’t affect our experience one bit. 4 – No one cares, except you. Jumping off the last point, no one cares if you are wearing a suit with tennis shoes on a cruise ship. No one cares if you wear the same dress to both formal nights. No one cares whether or not you forgot to put on makeup before leaving your cabin, or if you have straightened hair. No one cares if your toenails are painted, if your skin smells like Dolce & Gabbana’s Light Blue (my faaaaaaavorite), or if your gym attire looks different from the day before. No one really cares about these things… except you. So why not give yourself a break and unburden yourself of preconceived notions of what you need to do while on vacation, right? And if you are worried about these types of things while traveling, just be sure you are doing so for the right reasons. 5 – Just because it fits in a small bag doesn’t make it easy. It was NOT the easiest thing to lug around, regardless of its relatively compact size. My suitcase felt heavy. I was annoyed pushing it across uneven roads and footpaths, lifting it on and off the train, and just packing and unpacking all the things. 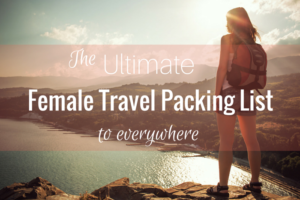 Packing smarter for me is always about packing lighter, not just smaller, and that is why I stress it so much on this site. There is a nice sort of feeling opening up the closet while traveling and having loads of options that can cover just about any scenario. It was fun being able to dress up with my partner in crime, and to do so with choice. It was great to not have to think about washing (or hand-washing) clothes in the middle of the excitement, or needing to spend money on things we forgot to pack (except for that darn aloe after I got sunburnt pretty bad – doh!). Still, at the end of the day, so much of what was lugged with me for the experiment went unused, and more was pretty much deemed unnecessary. While there is a relief at having all bases covered, I’m not so sure options will ever outweigh (at least for me) the annoyance of packing, transporting, unpacking, repacking, and transporting again said stuff when I travel. P.S. Have a read of these cruise hacks, or this post on packing for a cruise.